On my way home from watching Gustavo Dudamel's debut last night with the New York Philharmonic, I found myself unexpectedly depressed. Not because his performance wasn't thrilling, or didn't live up to the extremely high expectations that had been set by the media and by his debut three weeks ago with the Simón Bolívar Youth Orchestra of Venezuela. 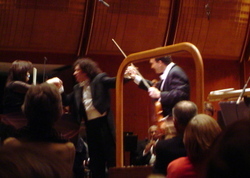 I was depressed because, being 10 years older than the 26-year-old Dudamel, I suddenly found myself in the unfamiliar territory of knowing that I won't get to see this still-raw talent in his seasoned old age, when many conductors come to exhibit gifts of wisdom and mystique largely absent from their hot-shot youth. But, I'll take what I can get - which, in the case of Dudamel, is like a Super Size order of McDonald's. Let's set the record straight about conductors: standing on a podium and waving your arms around is not, by itself, diffi cult. Noone in the audience is going to know if you forget where you are in the score, or if you deliver a confusing gesture. Your balls aren't on the line the same as if you're a brass or wind player coming in on a solo, where one squeak or squawk can lay ruin to an entire performance. Most of the real work is done during rehearsal, where the conductor does his or her best to convey their vision of the piece to a bunch of scruffy musicians who are at best suspicious - and often mutinous - towards anyone with new ideas. In Dan Wakin's insightful recap of Dudamel's Philharmonic rehearsals this week, the general impression was that he stuck to his guns and showed a lot of energy - some generously compared him to a young Leonard Bernstein - but that he is still clearly inexperienced. After watching last night's program of Dvorak, Prokofiev and Mexican c omposer Carlos Chávez, it seemed to me that Dudamel's stature as a conductor, whatever that is, boils down to one essential ability: he stirs the pot. 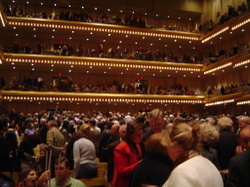 More than once - especially in Prokofiev's 5th symphony, which he conducted from memory - I saw Dudamel coaxing the musicians along, asking them to let go more than they're used to under the septuagenarians who regularly come through here. Which, for a hidebound lot like the Philharmonic - some of whom have been playing these works for nearly sixty years - is no mean feat. (I'll save the question of whether or not musicians should be allowed to stay in the Philharmonic that long for another post.) The result was a mostly-clean, energetic performance th at nearly lifted the roof off in the voluble finale. 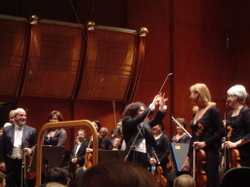 For his part, Dudamel seemed pleased as punch with the results, going around to all the individual principals to embrace them or swap high-fives. 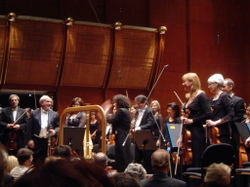 In case you missed it, Dudamel conducts this same program with the Philharmonic tonight at 8:00 and next Tuesday at 7:30. 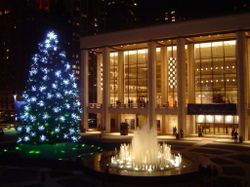 It looks like both concerts are sold out, but there were a number of folks trying to unload theirs last night in front of Avery Fisher, so go take your chances.